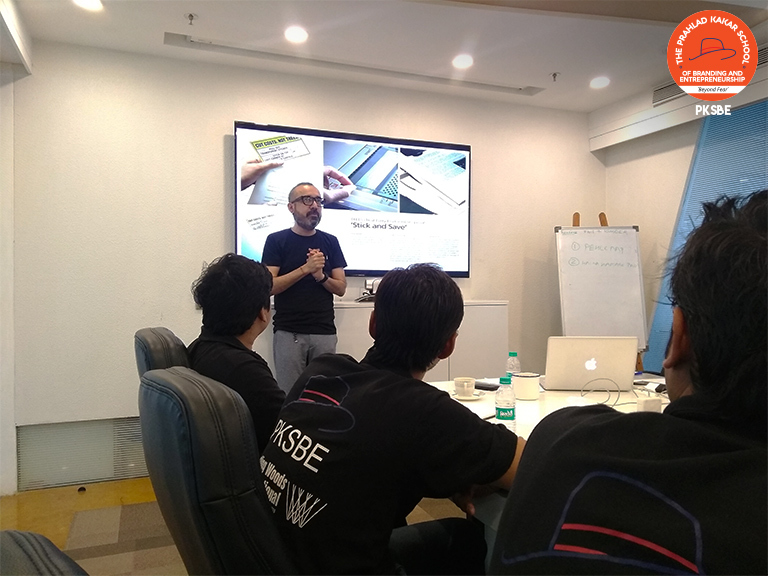 This Monday, PKSBE students got a taste of the advertising life when they walked in the swanky office of Rediffusion Y&R, located in Lotus Corporate Park. As all nineteen of them sat in the chic conference room, they were greeted by Jaideep Mahajan, or JD as his colleagues call him. A Delhi College of Art graduate, Jaideep has been in the advertising industry for twenty solid years. He has worked in some of the biggest advertising organizations, such as McCann Erickson New Delhi, Leo Burnett Advertising Malaysia, McCann Erickson Malaysia, JWT New Delhi, Linen Gurgaon, and now Rediffusion Y&R Mumbai, where he holds the position of National Creative Head. The first campaign Jaideep showed to the students was a coffee table book campaign on AIDS awareness. The students were inquisitive about the entire creative process. He took their questions patiently and offered enlightening insights. While discussing the Save Paper Campaign, he said “Dil ko lagni chahiye baat”, i.e. “It should touch my heart.” In this campaign, they identified the copy machine in an office as the place where most paper wastage occurs. Then, they came up with these stickers and stuck them onto the screens of the copiers. The stickers asked the users to use both sides of the paper, and recycle them. Now, every copy printed from these copiers had this note printed to it. Simple, yet so effective. While his self-designed illustration for Malaysia’s largest bookstore, Kinokuniya left the students in awe, while the Airtel campaign stimulated an interesting discussion. JD made students realize how challenging it is to sell a product like Airtel that is not really tangible. Hence, to sell a product like that, you sell promises, you deal in emotions. He showed students multiple films from one of the campaigns he worked on with Airtel, one of them being “Baat karne se hi baat banti hai”. All of the films were very emotional and struck a chord with the audience. He also showed the students a very unconventional and heartfelt film he helped create for Dabur Vatika. He went on to show the students the campaigns for MTS, Tropicana, Videocon, Moods, Tata Motors and shared the brief, the thought and the approach behind all of them. After taking the students through some of his great work in the advertising industry, he interacted with them about their own goals and aspirations. He tried to understand how they were approaching their careers and advised them accordingly. Before the wisdom-satiated, hungry students leapt onto the sandwiches and soft drinks provided by the gracious Rediffusion management, he concluded his session with the promise to dig even deeper in the nitty-gritty of advertising in their next meeting.